An aromatic grass native to tropical regions in India and also cultivated in Guatemala, Brazil, China, Africa, Haiti, Madagascar, Sri Lanka and Nepal. 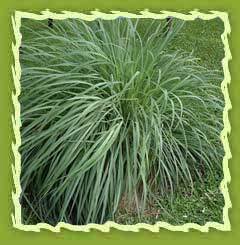 It is a perennial, aromatic, tall grass with rhizomes and densely tufted fibrous roots. It has short underground stems with ringed segments, coarse, green slightly leathery leaves in dense clusters, terminating in a long bristly point. The blades of the grass are about 90 cms long and 0.5 cm wide. Chemical constituents:: Lemongrass oil has various chemical compounds that include myrcene, citronellal, geranyl acetate, nerol, geraniol, neral and traces of limonene and citral. Extraction: It is extracted by the steam distillation of the dry leaves. It has a pleasant lemony fragrance and has antidepressant, antiseptic, bactericide, carminative, deodorant, digestive, diuretic, fungicide, galactagogue, insecticide, prophylactic, stimulant and tonic properties. Its aroma inspires and brings fresh energy, clears the mind. Popular skin care ingredient for oily, mature and inflamed skin (in moderation). This reviving oil will re-energize a person and helps the body recover after illness by invigorating the glandular system. Oil treats problems with the digestive system, usually in children and is also useful for relieving muscle spasms. It furthermore has a positive effect on nervous conditions and provides a gentle boost when exhausted. Lemon grass can be used externally to treat ringworm, lice, athletes foot, arthritis and scabies. It is used to normalize and balance overactive oil glands, dandruff and similar skin problems. It is commonly used in acne and insect repellant blends. Lemongrass is a favorite of soapers for its staying power in soap. It is excellent for skin and supporting the body, use in a carrier lotion or oil for massage. Lemongrass can be used with a carrier in the bath. It is used in insect repellents, room sprays, soaps and detergents. Lemongrass essential oil is found most often in cosmetics such as hair conditioner and facial water lotion for oily hair and skin. Lemongrass essential oil can also be used as a deodorant to curb perspiration. It is used in making body butter which replenishes moisture to skin cells while protecting the skin. Natural fresh-cut lemongrass detoxifies as it purifies. After the distillation process, the exhausted grass is used locally to feed cattle. Lemon grass features in Indonesian, Malaysian, Sri Lankan and Indian cooking and is widely used in savoury dishes and meat, poultry, seafood and vegetable curries. It harmonizes well with coconut milk, especially with chicken or seafood, and there are countless Thai and Sri Lankan recipes based on lemongrass. The stems are also used in teas or used in pickles and in flavouring marinades. Lemongrass tea can be prepared by steeping 1-2 tsp of the herb (fresh or dried) in a cup of boiling water. The mixture should be strained after 10-15 minutes. The tea is generally taken several times a day and is rejuvenating. The dried spice is available in several forms: chopped in slices, cut and sifted, powdered and is often used as salad dressing. Lemongrass oil has been used to demonstrate the superiority of near-infrared spectroscopy to older methods of determining the chemical content of plant oils. Lemongrass oil is widely used in soaps and lotion bases. It is used for bath and shower gel, bubble bath, conditioner, hand and body lotion, shampoos and liquid castille soaps. It is an excellent insect repellent. Lemongrass also freshens the air with natural fragrances, thus eliminating the need for synthetic, harmful air freshners. It can be kept in the kitchen, study, bathroom, bedroom, office, workshop, glove compartment, garage, pocket, purse etc.